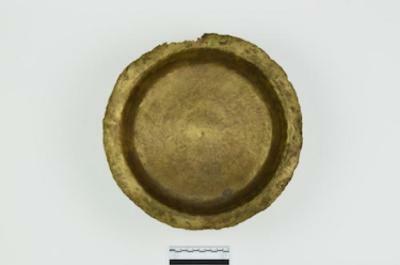 Originally nested with brass bowl #2000.06.0004. This is the larger of the two. Concentric rings expanding from the center of bowl to rim. Hammer marks. Height: 10.4 cm., Rim Diameter: 31.5 cm., Base diameter: 23.0 cm. Certificate of authenticity states that this object was recovered by treasure hunter Art Mckee from "an ivory slave trading ship, wrecked on Rebecca Shoal, Fla. Keys, in the late 1500's". Purchased along with 2000.06.0001, .0002, .0004 by M.F.M.H.S. for $133.96.Packed and transferred on Dec. 15, 2012 to Frazier International History Museum representative Katie Savale for shipment to Frazier International History Museum for Spirits of the Passage traveling exhibit.